Oregulin 90 capsules combine the unique pctency of CO2 extracted cinnamon and fenugreek with wild mountain-grown spices of cumin, myrtie, and oregano. 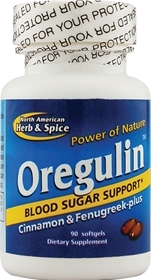 Oregulin is ideal balanced support when taken in combination with a health diet and excercise regimen. Consult your physician if you are taking diabetic medication.